Read a Personal Products booklet for older girls, The Periodic Cycle (1938). See similar booklets on this site. See also How shall I tell my daughter? and Personal Digest and read the whole booklet As One Girl to Another (Kotex, 1940). See a Kotex ad advertising a Marjorie May booklet. See many more similar booklets. And read Lynn Peril's series about these and similar booklets! Read the full text of the 1935 Canadian edition of Marjorie May's Twelfth Birthday, probably identical to the American edition. See early tampons and a list of tampon on this site - at least the ones I've cataloged. See the first page of the booklet. See the contemporary Kotex booklet for girls Marjorie May's Twelfth Birthday (almost complete booklet, 1928, Kotex, Australia) and the complete booklet, 1935, Canada; cover, mid-1930s, U.S.A.; and the complete Marjorie May booklet, 1938, U.S.A. I thank again the retired-teacher contributor of many items and much information to this museum! Below: I dropped the color to lower file size. All pages are the blue of the cover and all text and illustrations are black. "[P]ossible formation of bacteria" is an understatement. Read the truth here. Note that they don't identify the "woman specialist." See the contemporary Kotex Marjorie May's Twelfth Birthday (almost complete booklet, 1928, Kotex, Australia) (complete booklet, 1935, Canada) (cover, mid-1930s, U.S.A.) (complete booklet, 1938, U.S.A) Photo of Mary Pauline Collender, author of the Marjorie May stories - Read a Personal Products booklet for older girls, The Periodic Cycle (1938). See similar booklets on this site. Health Facts on Menstruation, by Lloyd Arnold, M.D. 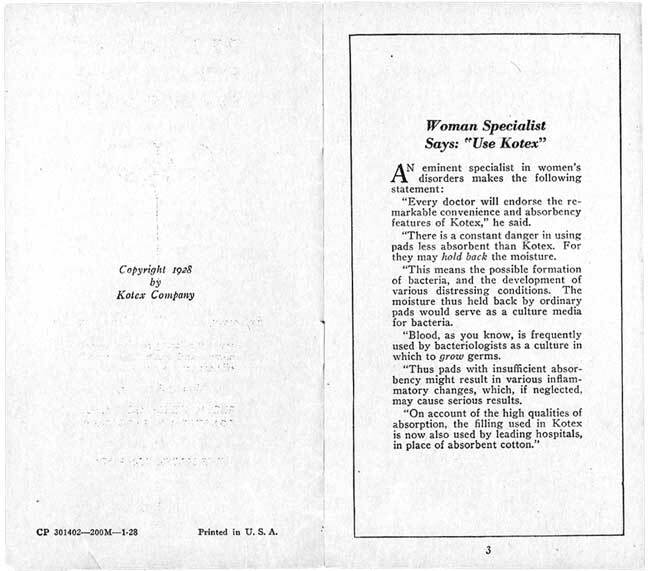 (complete booklet, 1933, Kotex, U.S.A.) and read the whole booklet As One Girl to Another (Kotex, 1940). Whole list of such booklets.